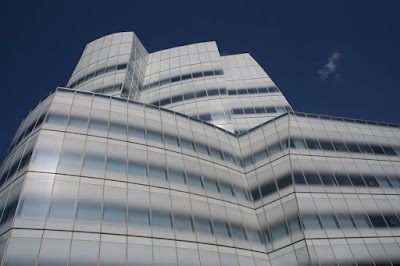 Gehry's first building in New York is the IAC building looking out on the Hudson in Chelsea. The reception area is astonishing - behind the desks, the earth floats and spins on huge digital panel underneath the clouds. The planet is perhaps three metres in diameter, and appears to be a real-time representation. To the left of the spinning globe, analytics for various websites flicker away in real time, with twinkling lights on the earth corresponding to unique users. Match.com came up, with around 500 people arranging to meet for a date per second, out of 180,000 users online. One has a sense of the cosmos slowly being interwoven by digital communications, as if the internet is now part of the universe, which of course, it is. Odd to see him use materials other than titanium. You didn't miss David Zwirner's Gallery right around the corner and the Shigeru Ban building going up too!